Bicycling advocates – fresh off finalizing a plan for Houston’s bike future – face the challenge of getting formal city approval of their ideas as they incrementally piece together what could be a $500 million investment. Changing attitudes, however, have proponents optimistic that most if not all of the 1,800 miles of bike lanes, trails and shared use paths will be built in the next decade. If fully built, the bike lanes and trails would provide an alternative to driving that’s not easily available to most Houstoninans for trips ranging from workday commutes to visiting a park on weekends. Moreso, supporters said, it will signal an important shift in the city’s commitment to keeping riders safe, lowering dependence on automobiles and reducing vehicle emissions. “There is growing recognition that we need to rethink our mobility paradigm,” Houston Planning Department Director Patrick Walsh said. Accomplishing all of the plan, however, will take a large investment over the next 20 years, estimated at more than $550 million based on the highest cost projects. Funding for the projects could come from the city’s street money, its share of Metropolitan Transit Authority’s 1 percent sales tax and state and federal dollars that can be spent on city infrastructure projects. 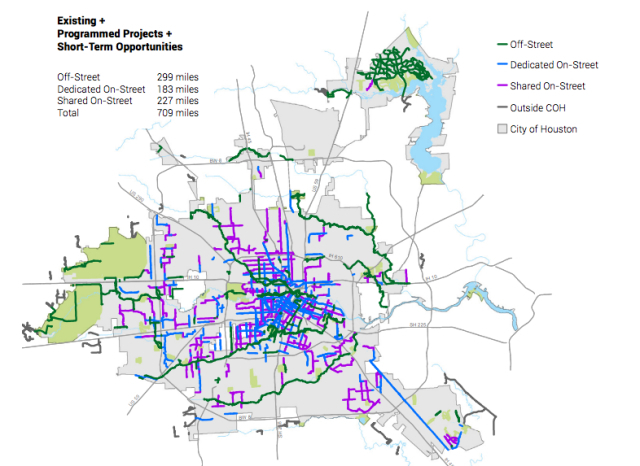 Houston has trailed some of its peer cities in securing federal funds related to bicycle and pedestrian improvements. Despite the price tag, the plan has support from a host of local groups, including Bike Houston and various neighborhood groups and Houston Parks Board. Compared to billions in highway spending – a plan to widen Interstate 45 alone is estimated to cost $7 billion – the investment in better bike lanes is minimal, when incorporated into other road improvements and trail enhancements. See here and here for the background. You can see the final report and all other information on the plan here. It’s important to remember that a lot of funding for this will come from the Bayou Greenways project and existing CIPs, and from grants from H-GAC and the federal Department of Transportation. A significant portion of the plan involves simple and inexpensive changes like restriping streets and taking lanes from low-traffic streets like Austin and Caroline downtown, in similar fashion to what was done on Lamar Street. There’s much that can be done for very little, and by adding this capacity you are giving people more non-car options for short trips, which in turn makes it a little easier for those who have to drive and park. It also makes things safer for the folks who have to get around by bike. There’s a lot to like here, now we just need to get it approved and on its way. The Press and KUHF have more.